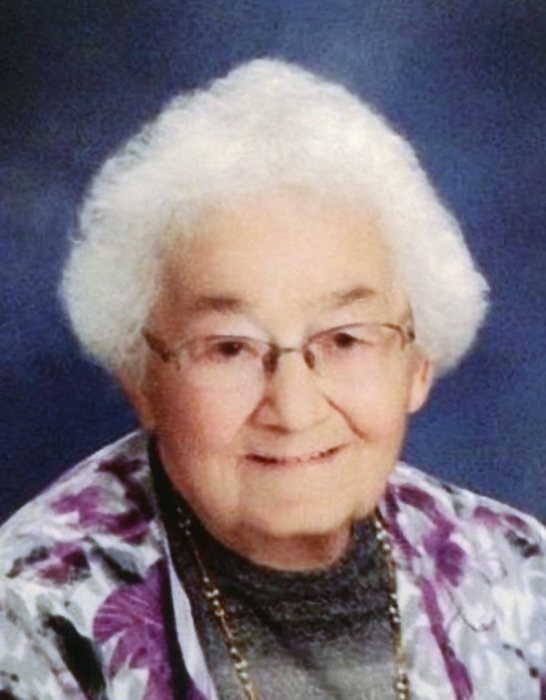 On January 25, 2019, our cherished mother, grandmother, great-grandmother, and great-great-grandmother, Marie Hein, finished the work she was called to do on this earth. We can only imagine the joy she felt as Jesus welcomed her to her eternal home. Marie was born in her parent’s bedroom at the Jacksonport Post Office on April 28, 1922. She was the oldest of Fred and Gertrude Erskine’s five children. A year after graduating from Sevastopol High School, she married Stanley Robert Hein at the Episcopal Church in Jacksonport on May 4, 1940. They began their life together in a home next to the house where Stanley was born in Jacksonport. A year later they moved to Sturgeon Bay, where they bought a house on North Fifth Avenue. They were blessed with three children, Stanley, Jr., Marilyn, and Gary. Marie remained in their home after Stanley died on March 1, 2007. When it became too difficult for her to get up and down the stairs, she went to live with her youngest son Gary and his wife Rosemary in Green Bay. Five years later, she moved to Anna’s Healthcare in Sturgeon Bay with her loyal Shih Tzu Molly, who faithfully slept by her feet the three years she lived there. Marie was a hard worker all her life. In the summer, when her children were young, she took them with her to pick cherries at the local orchards. At night, she worked in the canning factory. She was almost 40 when her life changed dramatically. Stanley became ill with rheumatic fever and couldn’t work for two years. She courageously learned to drive and began working in the meat department at the Red Owl store, where she won awards for being the friendliest employee. Always willing to help others, when they needed help at noon across the street at the bus depot, Marie spent her lunch hours serving customers. She will be most remembered though, for the many gifts she made by hand for those she loved. She was an excellent seamstress and sewed clothing for her children and grandchildren. She delicately embroidered, knitted, and crocheted dresses for the girls. She lovingly knitted and crocheted baby blankets for every grandchild, great-grandchild, and the children she babysat for after the Red Owl closed. She was always working on projects: quilts, crewel embroidered wall hangings, ornaments and decorations for every holiday, and dolls and stuffed animals, for which she made clothing with attention to every detail. She was very sad when, in the last years of her life, arthritis in her hands stole her ability to create the gifts we treasure. Marie is survived by many generations of family. In her generation: her sister Caroline Zook, her brother Hilton Erskine, and her cousin Marge Junger. In the next generation: her son Stanley, Jr., and his wife Mary Ann; her daughter Marilyn Hein; her son Gary and his wife Rosemary. Following that are 15 grandchildren, 45 great-grandchildren (another great-grandchild is due in May), and 17 great-great-grandchildren. Marie was preceded in death by her parents, Fred and Gertrude Erskine, her husband Stanley Hein, Sr., her brothers Eugene “Pete” Erskine and Marion “Mike” Erskine, her grandsons Kyle Erskine Jome and Thomas Michael Hein, and a great-granddaughter, Aubrey Faith Held. The family wishes to thank the loving staff at Anna’s Healthcare, the compassionate staff at Door County Memorial Hospital, and the supportive nurses at Unity Hospice. All are welcome to come to St. Peter’s Lutheran Church on Friday, February 8, 2019, for visitation at 10:00 am and funeral service at 11:00 am, followed by lunch. Burial will be in Lakeview Cemetery in Jacksonport. Forbes Funeral Home & Cremations is in charge of arrangements.